BIEM (Bureau International des Sociétés Gérant les Droits d'Enregistrement et de Reproduction Mécanique) is an organisation coordinating statutory license agreements among different countries. 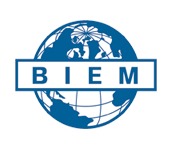 BIEM is based in Neuilly-sur-Seine, France, and represents 55 societies, from 59 countries. This is a list of BIEM member organisations. If there is a problem with the release origin You look for the info on the case, booklet or, in most cases, on the CD/DVD. Look for _____/BIEM or BIEM/_____ in example GEMA/BIEM is Germany or GEMA/BIEM/ZAIKS is Poland.